The earthquake in Haiti on 12 January, 2010 caused massive damage and loss of life in Port-au-Prince and its surroundings. Among the immediate needs, shelter, water, sanitation, hygiene and temporary employment are particularly pressing. The most vulnerable are pregnant women and children under eight years old. As a part of its 90-day and 12 month integrated multi-sector earthquake response, World Vision (WV) has implemented a 9 month Early Childhood Development Learning Space (ECD-LS) programin 40 settlement communities of internally displaced persons. In Port-au-Prince and other affected areas, the school and higher education system has been destroyed. Many students, teachers, and Ministry of Education staff were killed or injured. WV’s ECD-LS initiative aims to provide community-based learning for 12,000 children (0-8 years old) and for the 500 youth aged 17-25 who are serving as volunteer community educators. 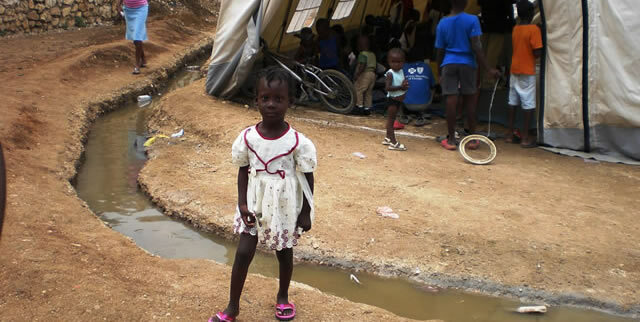 WV’s Early Childhood Development initiative for Haiti provides a secure learning space for the large number of young children who are living in tented communities. The severity of the situation means that youngsters aged between 17-25 years of age are serving as pre-school teachers. These youngsters have lost their own educational opportunity (either at high school, college or university) and so WV, UNICEF and other partners are providing community-based training to enable them to become effective community educators. World Vision with GULL is augmenting this effort via action learning and the provision of a continuing pathway to a Bachelor of Professional Studies (Community Education) degree for the group of 500 youngsters who would otherwise have no opportunity to engage in continuing, further or higher education. Approach: WV has organized training inputs for all volunteer community educators. The GULL L1 and L2 activities will enable them to reflect, review and professionalize their roles and to develop others skills by action learning. On completing L2, the initial groups will facilitate (as part of L3) for new L1 groups. This will enable us to ‘cascade’ to all 500 (and beyond) as quickly as possible. Approach: Vision-GULL is using a combination of training inputs and GULL generic action learning outputs (e.g. the personal learning statement, diary format reflection cycle and return on outputs form) to enable all participants to capture their insights, experiences and learning outcomes as they progress. Verifying learning outcomes: Learning outcomes are always verified by the local facilitator (the internal reviewer) prior to GULL certification (GULL L1-4 awards) and additionally by an independent local external reviewer (GULL L5 awards). All reviewers are asked to prepare a concise report confirming their recommendations for each candidate (either: accept or defer until any gaps have been addressed). Evidence of learning and application is mandatory. 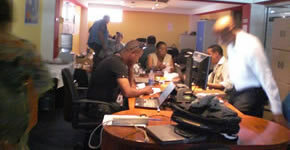 WV has some 900 national staff in Haiti with more than 75 based at the Port-au-Prince headquarters. 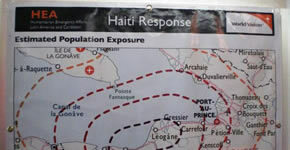 Additionally, WV has around 50 international staff from its global rapid response team deployed in Haiti and collectively, their work is enhancing the speed and impact of the response by building on the goodwill, trust, and results already achieved in the country through WV’s Area Development Programs (ADPs) and other initiatives linked to WV’s broader earthquake response program. Left: WV Emergency Response team office | Right: a map of the most affected areas. Right: 17 March –lead team meeting at the WV National Office, Haiti. Each team member will facilitate a group of GULL professional Bachelor degree participants as part of their own GULL professional Master degree pathway. Others like Reniteau Jean, a professor at the University of Port-au-Prince will assist us in cascading GULL to the wider community. WV is caring for many thousands of people. Part of its response is to provide a learning space for young children in the camps. It is here that the 500 youth are working as pre-school teachers. The children and youth are learning together in these densely packed camps, yet the youth are finding ways to make the learning space enjoyable and stimulating for the children. 17-25 year old community volunteers are providing pre-school and continuing education in a creative and highly professional way. The volunteer community educators are undertaking a critical role in creating and sustaining a child-friendly environment for young children – many of whom are traumatized by the impact of the earthquake. 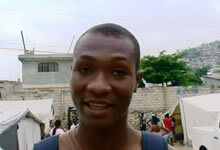 Until the earthquake, Dan* was a first year law student at university in Port-au-Prince. He was in class when the earthquake happened. He saw the walls shaking and ran for the door – just as the walls collapsed. He does not know how he made it to safety –he was the only survivor –his professor and all his class mates died. Dan told me that he has the same nightmare every night and he is terrified by the tremors that have occurred since the earthquake. In addition to all this, Dan has lost his opportunity to qualify as a lawyer -his university was destroyed. The WV ECD-LS team told me that Dan is an outstanding community educator. He makes learning fun for the children and he is also teaching them English. Dan now has another opportunity to learn via Vision-GULL. He starts his Professional Bachelor of Studies degree (Community Education) on Monday 22 March 2010. *Dan’s Christian name is abbreviated. He spoke to Richard Teare and gave his permission to share this story. There isn’t much to smile about in Haiti at the moment. But these are the spontaneous reactions of Haiti’s volunteer army of young community educators when we spoke to them about Vision-GULL on 18 March. When we told them that they could start their professional Bachelor degree on Monday 22 March –they couldn’t believe it! Vision-GULL is starting with Haiti’s youngsters in the age range from 17-25. They are now by default, Haiti’s frontline community educators. This group has lost its opportunity to enter and graduate from an academic institution –but they can build their personal and professional skills in the community and help to lead and create an inclusive, community-based model for learning via Vision-GULL that will be led by Haitians –now and for the future. WV Haiti’s National staff and the many other volunteers working with WV in Haiti will also become Vision-GULL action learners and through their efforts, there is hope for the future. Right now, Haiti’s children and community educators have few resources – but their spirit and enthusiasm for learning will sustain them and help to build a brighter future. World Vision International (WVI) is a Christian relief, development and advocacy organization dedicated to working with children, families and communities to overcome poverty and injustice. WVI is also the world’s largest non-governmental organization and its work spans some 97 countries with people and communities from all religions, races, ethnicity and gender. WVI is working with GULL to provide opportunity and access to lifelong learning for the many communities that it serves. The Vision-GULL initiative is founded on the practical, professional and holistic development that occurs in local communities, where we encourage, recognize and certify the outcomes of action learning. We are especially concerned to provide opportunities to learn for those without the funds, academic qualifications and access to any other form of further and higher education. 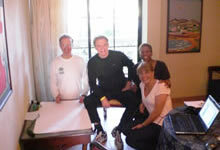 Donations specifically for Vision-GULL’s work can be made directly to World Vision International.